Opening a restaurant takes passion, grit, and determination. You pour your efforts into creating delicious dishes, then open your doors to the public. Unfortunately, this is the point where many restaurants have trouble generating enough sales through word of mouth alone. If your restaurant has started to plateau in terms of how many new customers it attracts, it might be time to consider adopting a new digital marketing strategy. Here are 12 techniques successful restaurants use to stay on the cutting edge and grow their businesses. Food blogging is more popular than ever, with a hungry audience on the lookout for the next Insta-friendly meal. Original, engaging blog content with eye-catching photos can boost lead generation by as much as 89% depending on how often you post. People in your area need to be able to find your restaurant online, so a focus on local SEO is the most efficient way to reach them. Use Google’s Keyword Planner to find what diners in your neighborhood are searching for, then create content that incorporates those keywords to help search engines find your site. Do a bit of research about your area’s food blogging scene, and get in touch with bloggers you think would be a good fit for your restaurant. Popular online food writers have a built-in audience of passionate diners, meaning you’ll get your business in front of a group of potential loyal customers. Offer your email and social media subscribers special promotions like 2-for-1 drinks and meal coupons to increase their sense of value and keep them coming back for more. Promos help to ensure that your followers maintain awareness of your restaurant and encourage them to bring family and friends along the next time they visit. Learning who frequents your restaurant will help you to reach similar customers. For example, if you find that commuters stop in for coffee on the way to work, you can focus advertising efforts on the part of town where their workplaces are located. Social media marketing is an inexpensive way to create buzz for your restaurant. 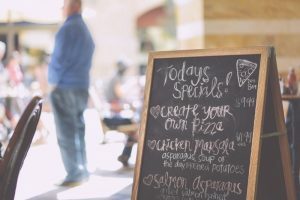 Smaller restaurants sometimes ignore the lead generating potential of social media, relying instead on word of mouth in their communities, but this is a mistake. Twitter and Instagram can put you in front of customers who would never have known about your business otherwise. Customers are increasingly likely to visit your website before they ever step through your door, so make sure it is as inviting as your physical restaurant. Your site should be easy to read on all devices and provide simple navigation to menus, hours of operation, special events, and contact info. Email marketing is one of the most consistently high-performing ways to grow your business. Consider putting an opt-in form on your site to allow users to subscribe to updates about special offers and events at your restaurant.